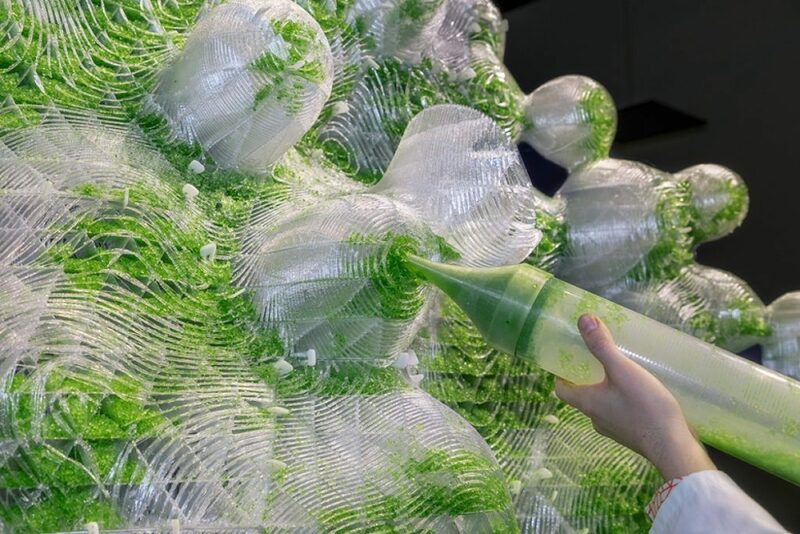 London based artistic duo EcologicStudio founded by Claudia Pasquero and Marco Poletto has been experimenting with bio-digital sculpting for many years. 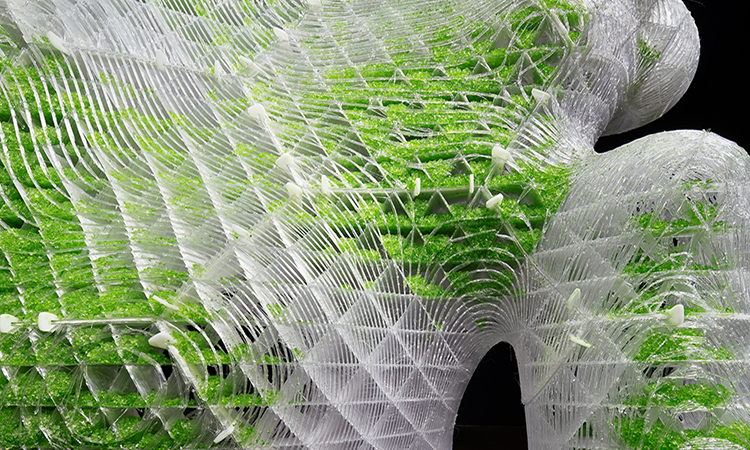 This time they collaborated with the Urban Morphogenesis Lab at University College London (UCL); the Synthetic Landscape Lab at the University of Innsbruck in Austria, and the Wasp Hub at the University of Southern Denmark. 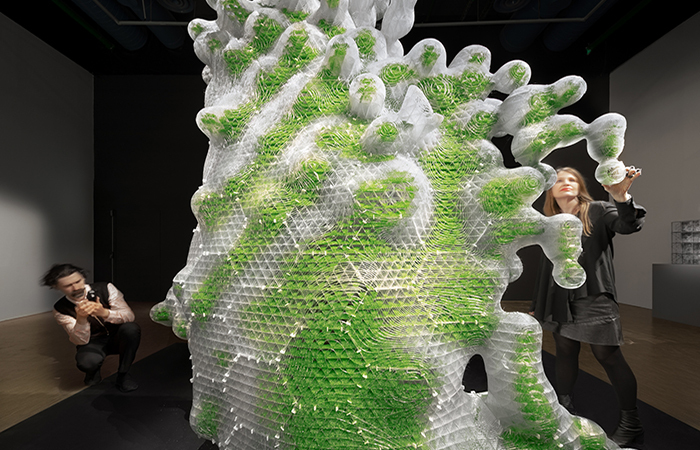 Their new exhibition has been inhabited by semi-living forms that the artists created by using 3D printing technology. The witnesses of their work genuinely marvel at the wondrous and amorphous creation that, in its essential respect, represents an artificial life. Behind the installation ‘H.O.R.T.U.S. XL Astaxanthin.g’ there is a digital algorithm necessary to prototype the growth of a substratum, fundamental layers of soil or rock that were 3D printed and divided into hexagonal units of 18,5 cm supported by triangular elements of 46 mm. The idea was to imbue a cyanobacterium using a bio gel into each of the triangular unit cells thus activating biological intelligence power of the system. These organisms possess a metabolism which runs on photosynthesis generating actual oxygen from radiation. Such a combination transparent and in some way incorporeal blocks inoculated with green liquid makes the viewer believe in the powerful nature of enlivened digital matter. Another work displayed for the visitors of the exhibition has been created by The urban morphogenesis lab. 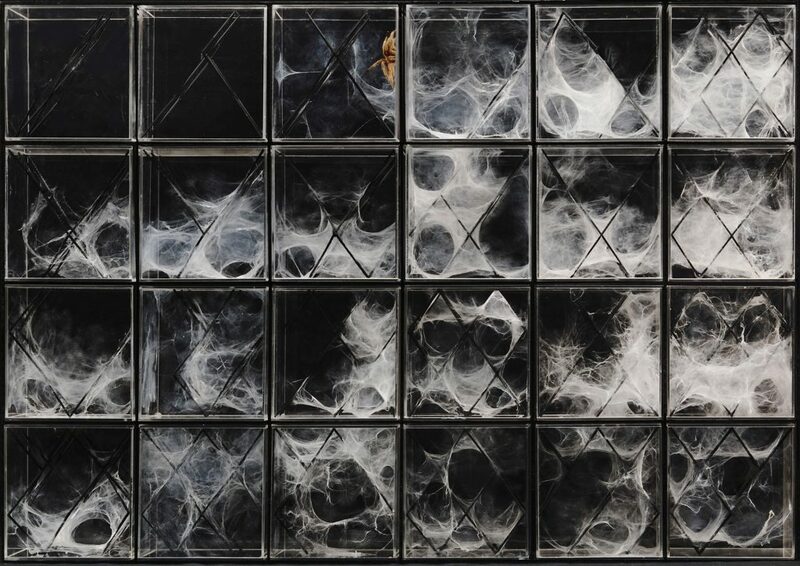 The work which is entitled as ‘XenoDerma’ creates a supernatural effect because it consists of a spider web prototype designed with a digital algorithm. As the creators found out, the information that their webs transmit constitutes an essential element of the spiders’ cognitive systems. This again is a justification of how innovative features of a digital sphere contributes to making new art pieces that can be viewed as vital otherworldly objects.